This spring every team will get their time to shine in the QNL Team Spotlight, and what better team to start with than the one representing the Netherlands at EQC 2018: the North Sea Nargles! The North Sea Nargles is a team known for their tendency to be unable to break the gender rule on most match days, and for being located in not one, but two cities. Home to some of the best seekers of the country, and one of the oldest teams in the Netherlands, the Nargles are a team to look out for! We spoke with their president and captain Charlie Hölscher. When and how did the team get started? In April 2014 at Elfia Haarzuilens, there was a introduction tournament organised by the predecessor of QNL, MQN (Muggle Quidditch Nederland). This is where Dutch quidditch really kickstarted, leading to the beginning of the Nargles. Some people were really eager to start a team after this tournament, en thus the Amsterdragons in Amsterdam was born. At the end of summer 2014, there was interest for a team to start up in Leiden. This team was called the Leiden Portkeys. 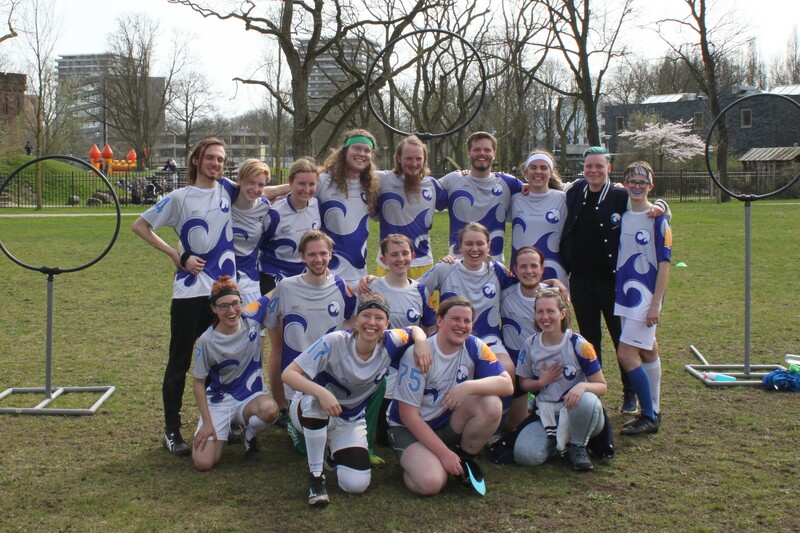 EQC 2015 was approaching and the Netherlands gottwo spots: one for the Wageningen Werewolves and one for another Dutch team. Since neither the Amsterdragons nor the Leiden Portkeys had enough members to go to the tournament, and there were already a lot of overlapping players, a new team was created uniting players from both cities. Thus, the North Sea Nargles was born! How did you come up with the team name? What about the logo? The team name was chosen by democratic vote at our founding party. Several other names were considered (amongst which something monstrous including cheese… we try to forget) but North Sea Nargles came out on top. We didn’t want to pick a city name since we’re spread over two cities, so we figured, in this part of the country you’re bound to be near the sea. The logo was designed by our own wonderful Noah, who spent so much time perfecting a wave-themed visual that afterwards his head must have felt like it was full of Nargles..
What celebrity do you think would fit right in the team? Why? Hannah Hart! She is a queer dork who loves puns and general good fun, need we say more?